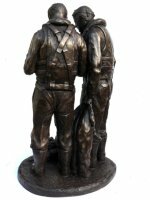 In the Autumn of 2010 David Coeshall approached me with a commission to produce a Mosquito Aircrew sculpture. 'Final Check' is the result of his vision. 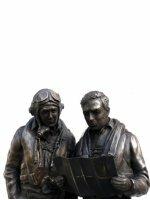 David is a great Mossie enthusiast and is closely involved with the restoration project at the de Havilland Museum. 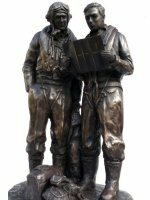 He was a great help to me during the making of the piece and kept me well supplied with photographs and information throughout. 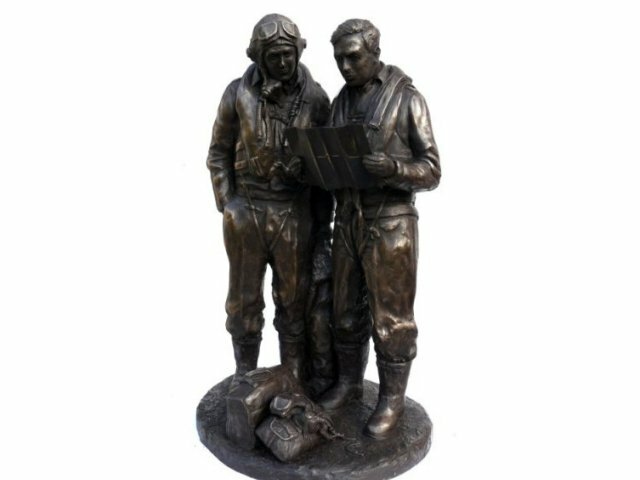 On April 16th 2011 the sculpture was unveiled at the RAF Club in London by former 235 Squadron Flt Lt Ray Harington and his navigator W/O Bert Winwood who flew together as part of the legendary Banff Strike Wing in Scotland..
20% of the proceeds from the sale of each sculpture will be donated to the fund to restore Mosquito prototype W4050 at the de Havilland Heritage Centre, Salisbury Hill. 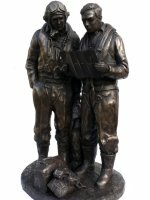 Each limited edition Mosquito Crew sculpture is hand engraved by Peter with its own unique edition number and will come to you with a signed certificate of authenticity.